A porch offers a unique design opportunity. You can create an outdoor living space when you approach your country porch design with the same attention to detail as you do inside your home. When you decorate your porch with a country theme, there are several design options available. Each will give your porch a distinctive look that can be used to either mirror or contrast what a visitor will find inside your home. Whenever you select Americana themed porches, you want to use the patriotic color scheme of red, white and blue. This can be achieved through a painted porch floor, walls and ceiling. Opt for a federal blue color for your wood porch floor and a white woodwork and trim. You may want to use a light blue on the ceiling or opt for a soft beige. White ceilings will help reflect more light, so this may be a good choice as well. A porch without at least one rocking chair is like a sandwich without bread. If using more than one rocking chair, consider painting one of the chairs blue, another one red and a third one white. If you prefer a more subtle look, opt for one color for all three chairs. Chair cushions give you several design opportunities to introduce color and Americana patterns such as stars, stripes and other Americana motifs in rocking chair and porch swing cushions and pillows. If your color pallet so far is blue and white, sprinkle in some red with brilliant red impatiens. This flower thrives on the low diffused light specific to porches and is an easy care plant in flower pots and planters. If part of your porch receives direct sunlight for much of the day, place a vibrant red geranium on the porch steps and then repeat the red throughout your porch design. Add a splash of yellow with other flower choices. Metal wall art gives your porch design an authentic feel. A distressed blue table beside a wicker chair is perfect for an outdoor table lamp for a cozy feeling at night. Place a wooden duck decoy near the table or add a wooden butter churn. A country cottage style takes advantage of quilt patterns and spring flower colors. You may want to add white wicker furniture or opt for more rustic style furniture designs. A braided rug is always a great look for a country cottage porch. If you have a small table by a chair or rocker, add a lace, floral or gingham tablecloth for a special touch. Don't forget ceiling fans to help cool you down on a hot summer afternoon. 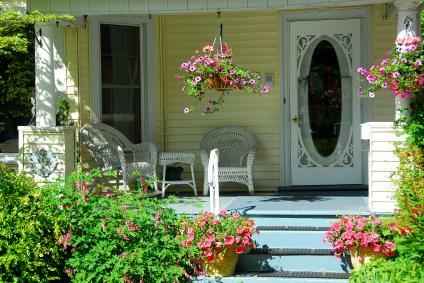 Hanging baskets overflowing with ferns or other foliage help to create a nostalgic ambiance. Add a few word art plaques, welcome sign or outdoor paintings. Don't forget the rosemary and lavender front door wreath that will greet guests with aromatic and visual delight. Hang a sun catcher made out of stained glass or a faceted crystal to reflect a rainbow of colors onto the porch. A rustic look is achieved with primitive country accessories, like carved wood folkart such as duck decoys and farm animals, a butter churn and even a few antique tools. Distressed painted wood finishes and bulky furniture style can be mixed in with willow styled settees or chairs. Cotton plaids and ginghams make great pillow and cushion accessories and are ways to bring in various colors to contrast with dark wood tones. Leave the porch floor a natural finish with a protective wood sealer. Add a rustic touch with ironwork wall art or old tools mounted on the exterior wall of your home for a collage effect. This type of design reflects a specific region of the country. If you decide to use a Western theme, then you have the choice of going with a Texan or Southwestern style. Use western motifs such as a pair of spurs hanging from a peg board, a saddle slung over the railing and a Texas star for a door decoration. Cowhide and tanned leather make great fabric choices for cushions and pillows. Try a cowhide area rug or use a small one for the front doormat. Mount a cowbell by the door for a classic look and conversational piece, as your guests enjoy ringing it instead of a conventional doorbell. Be sure to have at least one nice cactus specimen in a potted plant to complete your porch décor. Small porches can be just as impressive as larger porches. It all depends on scale, size and placements of furniture and objects. If your porch is short and narrow, think vertical whenever adding a design element or accessory. Keep the walking path clear so you can enter and leave the porch area without having to dodge a chair or plant. If there isn't any room for a chair, but you want a place to sit, consider a hanging chair, or a movable stool that can be pulled up to use as a seat. Collapsible chairs are another option you can store in a closet when not in use. Larger porches can be divided into separate areas such as a dining area complete with table and chairs and conversation section for a more intimate seating arrangement. Hanging baskets not only provide shade, color and texture, they can also provide privacy screening. There are many different country design styles you can use. You can change various elements and accessories according to each new season. Set your imagination free to create a truly unique and personal country porch design.